On Saturday, April 8th, 2017 The AOH and K of C Tank Pull Board of Directors from Clifton, NJ traveled to the Medal of Honor Grove in PA. 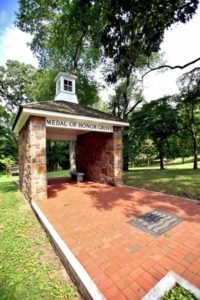 The mission of the trip was accomplished when the hardy volunteers helped clean up, restore and wash the NJ Memorial Obelisk and surrounding area of the New Jersey Medal of Honor Grove and the Military Chaplin’s Grove . Remember that the Medal of Honor is the Highest and Greatest Honor the United States of America can bestow on our military for their "Gallant Service Above and Beyond the call of duty". For more information on the history of Medal of Honor Grove visit http://www.freedomsfoundation.org/medal-of-honor-grove.